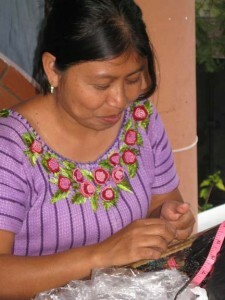 The Mayan women who make these beautifully crocheted and beaded kippahs live in the Highlands of Guatemala. They often work together in small groups for social purposes, and also have the option or working at home where they can easily care for their children. They spend anywhere from an hour to nearly two days to complete the meticulous beadwork that goes into each, individual piece of jewelry. For example, some Dunitz & Company bracelets will take a few hours to complete while an elaborate necklace can take more than two days to create. Dunitz & Company supports and contributes to a few organizations that help those living in the community where our beadwork is crafted. “Pueblo a Pueblo”, a community based charity funds many grass root projects including child education and lunch programs as well as mother-infant care. “Hospitalito Atitlan” is the only hospital that cares for those living in the community in which Dunitz works. “Puerta Abierta” is a free library that also offers reading classes.